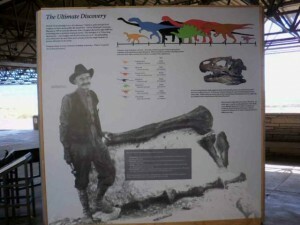 Large Display Board at the Dinosaur National Monument. Sorry I did not have my good camera which was in for repairs. This was taken in limited light with my little digital camera. For Earl Douglass one of the best finds was that of a complete skull, shown in the placard. Another of the displays at Dinosaur National Monument, Jensen Utah. 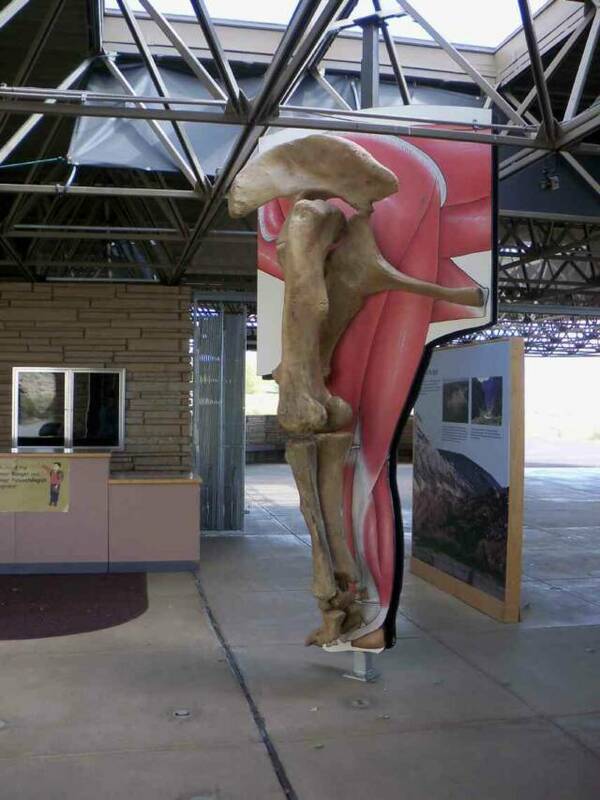 This is a dinosaur’s leg and hip bone. You can judge it’s height if you look at the counter in the background. 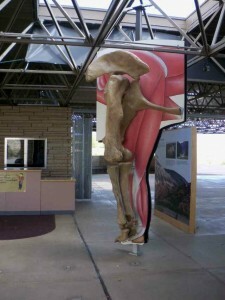 Today you can walk through one of the canyons and spot dinosaur bones sticking from the rocks for yourself. The bones have had some of the rock chipped away so that they are outlined but remain in bas-relief, so to speak. When the bones were to be removed, they were carefully cut from the rock and encased in plaster to protect them while they were transported from the site to Carnegie Museum or later to Salt Lake City. It was prodigiously hard work for men and four horse teams to get the bones from the mountains to the railroad. When bones were transported to the University of Utah, the cheapest means of transport was by horse and wagon. It took two weeks for the caravan to reach Salt Lake City and the newspapers of the day, including the New York Times, the Los Angeles Times and many others, reported their daily progress. When the long line of wagons reached SLC, June 24, 1924, they were paraded down Main Street and up to the University where the lead teamster shook hands with the President of the University. It was a BIG deal.